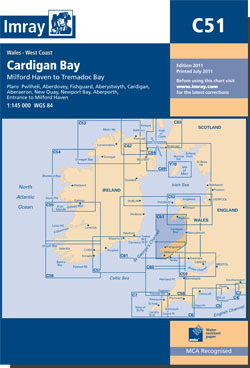 The west coast of Wales from Milford Haven north to Tremadoc Bay (Pwllheli). Scale: 1 : 140,800. One-minute gridlines. Larger scale plans of Pwllheli, Aberdovey, Fishguard, Aberystwyth, Cardigan, Aberaeron, New Quay bay, Newport bay, Aberporth, Milford Haven entrance. Tidal stream diagrams.